What’s worse than seeing a 20 ft shark? The short answer is: not having your camera, but that’s a story in it self. Today’s dive was to the U-869 AKA the U-who. 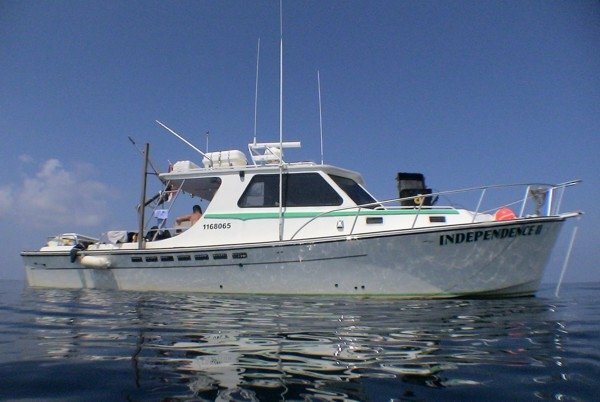 The Independence was filled with quality NJ divers, but most of them had never been on this wreck. I was diving with a student, Tom, who was also visiting the wreck for the first time. We headed out early in the flat calm seas left in the wake of Hurricane Bill. We made good time to the wreck. Bill and Brandon went into tie in. It often takes a few minutes since you never do anything fast in 230 fsw. I helped the first group of divers get in, then we geared up. After buddy checks, we reviewed the plan one more time, then splashed. The surface temp was high 70s, no current, and the water was very clear. Brandon and Bill were hanging, and Brandon took the opportunity to snap off a few of his great shots. If I were not with a student, I would have paused a few moments to give him a model, but Tom was dropping fast, and I wanted to catch up. We passed other groups of divers on the way. Many had lobsters in their bags. The line was completely slack all the way down to the wreck. No current at any level. This is unusual out here. Often the current changes directions at different levels. There was nothing, anywhere. It was obvious that there were many layers. You could see them as you passed through. The vis would change, and you could see the water go from cloudy to clear to cloudy. Some of the layers were thermoclines, and the temp started dropping. Below 120ft we felt the drop down to 46 degrees. After a few minutes it started to get dark, and I switched on my light. Now I could easily signal my position, and could see my buddy. Tom started slowing his decent. I’m not sure if he was waiting for me, or if he just needed more time to clear his ears. Either way, I caught up. My gauges indicated that we were within 50 ft of the wreck, but nothing was coming into view. We continued to drop. The faint glow of a strobe lit up the area. The vis had dropped to 10 ft, and the wreck suddenly appeared below us. The chain was wrapped around a cylinder on top of the wreck. With the short vis, I immediately reached from my reel. I’ve never run a reel on this wreck before, but I did not want to miss the line with a student in tow. Given the depth and conditions, I was concerned that Tom might be nervous. This proved completely unfounded, as he soon grabbed a lobster and put it in his bag. Not that we were here for lobster, but when they are right there, what do you do? Given the conditions, we swam slowly along the wreck trying to identify anything we could. We reached the Bow, and dropped down the side to the sand 230ft. This was perfect timing for our dive plan as it was time to turn around. We returned slowly to the line and arrived ahead of schedule. With a few minutes left we continued aft, and found that we were tied in just ahead of the break. We quickly inspected the blast area, which contains a jumble of ripped and torn steal, then doubled back to the line. At this point, I was happy I had run the line. The strobes on the anchor were no longer visible. We were only a few feet away, but could see nothing. For a few seconds your heart skips. Replay your steps. Ok, there it is. I was not so concerned for myself, as my gas plan left me lots of reserve. I never know how conservative a student is with there gas estimates. We reached the line with a minute or two to spare, and signaled UP. The long slow assent starts. The initial stops are still cold, and now that we are not swimming, the cold can be felt. Clearing the 100 ft stop brought the temp up to 55. That’s a huge change and it felt great. Soon we could see other divers above us. Those we passed on the way down the line, were now hanging at their shallower stops. Above 50 ft the temp jumped back into the 70s and vis was fantastic. Tom had run his numbers with the VR3, while I was running V-planner. As we discussed, I would have longer deeper stops, and shorter shallow stops. This was more evident that I realized. Most of my early stops, I was 10-20 feet below him. At 40 ft we matched up, then at 20 ft he indicated 10 minutes as I was cleared for the surface. At some point in this evolution, we were hanging with another four divers around the 20 ft stop. Two divers had ascended the anchor line, while the rest of use went up the Caroline line. Time passes slowly, and we were just hanging there for our stops to clear. I looked down and noticed a very large object moving in the water below us In the clear water, I could easily make out the features of a very large shark. The nose had the distinct features of a basking shark. From above we could not see the mouth, but the snout was unmistakable. I looked to my fellow divers who were transfixed on their gauges. I got their attention, and pointed out the shark. It swam slowly around the Caroline line below us, then doubled back to the anchor line. It swam around the lines in a figure eight, then swam slowly off into the distance. Since it swam between the lines, we knew it was only about 20 ft below us. Comparing its size to the divers on the bow line, I estimate it was a minimum of 20ft. I’ve seen Basking sharks before, but never this clearly. It was an awe inspiring sight! While we were really psyched at the incredibly cool experience, I was chastising myself for not bringing my camera. Given I was with a student, on a deep dive, I did not want the extra task loading. I was planning on grabbing it after the dive, and snapping a few shots of the other divers entering and leaving the water. Well, I did not have it now, and was quite disappointed! We spent the rest of our decompression looking around for the shark to return, or perhaps one of its school (as Basking sharks are know to swim in schools). No such luck. Once on the surface, we did talk about the shark, and some asked what type it was. I’m sure it would have been a much more heart pounding experience for those that did not know. I did grab the camera, and swam around the boat taking a few shots. Captain Dan, and Danny jumped in for a dive and to pull the hook. The sea was flat calm, with no current. It was an enjoyable wait just floating in the water. Before long we were underway for the long trip home. It was a great day, and many will tell the story of seeing a huge basking shark. During WWI the armored cruiser San Diego escorted convoys through the submarine infested waters of the North Atlantic. As irony would have it, she became the only major warship lost in the war by the US when she struck a mine in 1918. Like most warships, the heavy guns and armor caused her to flip over when she sank. She now lies upside down in 110 ft of water a few miles off Fire Island, NY. If you live in NJ and are interested in diving this wreck, there are a few options. First you can charter a NY boat, get up early, drive to NY, and fight NY traffic on your trip home. Captain Dan has worked out another option. He’s running charters from NJ. Due to the distance, this is more expensive than a standard charter, but can be cost effective over the tolls, gas, and traffic of the alternative. With many of the usual suspects in tow, we headed up to Fire Island. Upon arrival, we found a private dive boat tying into the bow. We agreed to tie in toward the stern. Danny had the job done in no time, and Divers started gearing up. Before long, it was my turn. Just like it’s been down off NJ, the surface was a little snotty, then it opened up around 30 ft. Here the vis remained 30 ft or so down to the top of the wreck. Danny had us tied into the keel near one of the large holes in the hull. My general practice for new wrecks is to do an extended visual tour to get my bearings. Given the vis, I was confident that I could see the line from either side of the wreck, so no reel was necessary. I headed into the light current, which turned out to be forward. Passing over several large breaks in the hull, I peeked in, then continued forward. Eventually the sweep of the deck became more prominent, and I found the anchor line of the other boat. They were tied into a portion of the keel that formed a loop just prior to sweeping upward. Here also were some smaller holes in the hull that allowed large Tog to swim in and out of the wreck. A large Trigger fish also darted in an out at this point, just keeping out of my reach. I now knew we were tied in about 200 ft from the bow. It would be a long swim to the stern. I dropped down a bit along the starboard side. The vis below dropped considerably. I could not quite make out the sand, but I could make out the large guns and mounts as I passed them. Again, I peered into each large opening as I passed, pointing my light around. One opening caught my attention. I could see the light of another diver sweeping back and forth as they swam inside the wreck. Nearing the stern, the prop shafts soon became evident. I was looking forward to seeing what would surly be an impressive set of props. No such luck. They were gone. I found out later, that they had been salvaged years ago, and the salvage effort resulted in the sinking of a savage barge. As it turns out this barge is known to be a good lobster dive. After swimming the length of the ship, the best bet for penetration seemed to be just forward of our line. After returning to the area, I found Bill making his way in. I didn’t want to stir up the silt on him, so I went further forward where there had been some other large openings. Here the ship is not as wide, and in some of the areas, you can swim completely through. Swim in one side and out the other. Looking through the debris, on the bottom, there were coils of wire here and there, and the ever present silt. One section contained a bulkhead with what appeared to be stacks of shelves. There were openings into deeper sections of the ship, but I was running out of time, and only took the 50cent tour. After poking through a few more openings, I was about out of time, and headed back. With the proper training and dive buddy, this wreck could be very interesting to explore. As it’s my first visit, I enjoyed just poking around in some of the more open spaces. On the long trip home, the seas picked up a bit making for slow going, but we were still home for dinner. Had this been a charter from NY, dinner would have been much later. Tuesday, the weather finally cooperated, and the Independence II kicked off the off-shore dive season. Dan had a few other dives scheduled in July, but the conditions were not right. Yesterday there was a light breeze, and nearly flat seas. We left early, and Dan and Bill took turns at the helm. Franky and I jumped into clear blue water to set the hook. The line was visible for 50-60 feet below us. Below 80 ft the vis dropped, and the sunlight quickly died out. Only our dive lights could be seen at this point. Once on the bottom, we tied in quickly and started to look around. The bottom temperature was 46 degrees with 40-50 ft of vis. It was tough to tell since it was so dark. I was surprised by the lack of fish and lobster. Normally cunners are everywhere, but not here. On many deep wrecks, the lobsters are out during the day. Perhaps it’s the lack of light at depth, but they seem to be more active, and often more abundant. Not today. Time goes quick at this depth, and it was soon time for the long cold ascent. The thermocline at 80ft was quite welcome. There was another one at 40 ft that brought the temp up to 75 degrees (almost hot). Visibility here was over 60 ft, and I could clearly read “Independence II” on the back of the boat. With Franky and I were aboard, Dan and Bill geared up and jumped in. While we waited for the other divers, we could see disturbances on the water surface, some 200 ft from the boat. This occurred several times, then for a brief moment, we could clearly see tuna jumping 4-5 ft out of the water. While looking for divers on the line, we could see Mahi-mahi swimming under to boat. Unfortunately the divers did not notice them. With Capt Dan and Bill aboard, we soon got underway for the trip home. Just then, a whale breached some 200 yards off the bow. It’s body nearly cleared the water. On the trip home, the radar lit up as we passed a group of 20-30. Checking the charts, this was apparently a popular tuna fishing location. Well we certainly saw a good number of them. I’m sure the fleet did also.